I recently bought a 2016 Cannondale Synapse Carbon Disc road bike, which is working great -- however I notice that occasionally when my front wheel hits a bump (e.g. a small pothole or the lip of a driveway), the front fork (or something beneath it) goes into some sort of vibration mode and makes a noise that sounds a lot like the "twang" of a door-stopper for about a quarter-second. It's a little surprising when this happens (both due to the unexpected sound and the vibration I feel through the handlebars), but I don't observe any obvious problems other than that. I have a GT Grade Carbon which is designed and produced by the same corporation as your Cannondale. I have the described effect on high speed braking only which is quite common problem and it's easy to find information about it over the internet. Moreover, this effect was one of the reasons manufacturers switched to through-axles on road bikes too, and I believe it makes sense because this vibration makes quick-release loose with time. Make sure to check it more often while you have this effect unresolved. Please let us know if tightening the headset helps! I would guess these are the spokes. When hitting a bump, you wheel gets compressed. The harder you hit it the more. 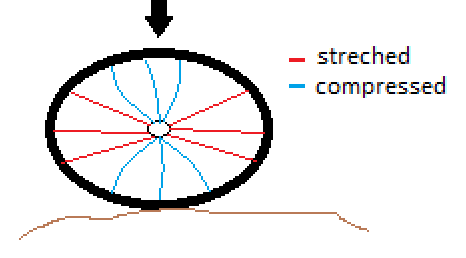 When you wheel is getting compressed some (Upper and lower) spokes obviously loose their tension. The wheel then will pop back in it's original shape due the rest of the spokes which are streched. This will bring back the tension to the compressed spokes which usually is noticeable with the "twang" noise. It may be a hint that you need to tighten your spokes. The looser your spokes are, the more compressed the wheel can get, which again can loosen your spokes even more. This can create a downwards spiral until the spokes start breaking. Simply check your spokes an tighten them if necessary. Pretty much any bike’s gonna ‘ring’ a bit if you hit a sharp bump hard. It should not be making that noise though. I’d just go over the whole bike looking for anything loose. Don’t forget cables, housings, spokes etc, You can try dropping the bike onto its wheels from six inches or so to see if you can replicate and locate the general area the noise is coming from. Not the answer you're looking for? Browse other questions tagged road-bike disc-brake noise or ask your own question. Very loud cracking/creaking sound on the bike?